Can you tell if a snake is venomous by its colour? What is the real chance of being bitten by a snake? Can you really die in 30 seconds? Ever put out a saucer of milk for a snake? Many of us have an instinctive fear of snakes and other reptiles. Over the last 200 years, we have built up a strong negative image of them, especially snakes. It is an image that has been reinforced by many fallacies and misconceptions. Living with Snakes and Other Reptiles provides a layperson’s account of why these creatures behave the way they do and what makes people get into trouble. The book sheds new light on snakes, lizards and crocodiles, helps you to identify them and dispels some common myths and fallacies. 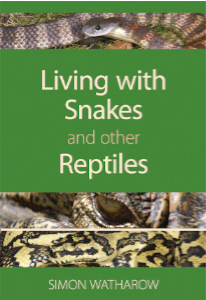 In revealing the fascinating world of reptiles, the book provides the reader with the knowledge to better cope with them at home and in the workplace. Exclusive to Wildlife Secrets - order online and receive your orders signed by the author, Simon Watharow. Simon Watharow has been a professional herpetologist for 15 years and has written more than 20 research papers on reptiles. He has a specific interest in the ecology of Australian snakes, including their diets, reproduction and their behaviour around residences. He has travelled extensively around Australia working with snakes and other reptiles and has lectured on methods of snake control and public safety to government rangers, wildlife rescue groups and community groups. He is well known for his training programmes on snake awareness and reptile control, and has appeared regularly on television and in print media. Simon is also editor-in-chief of Wildlife Secrets magazine. Photos and brief descriptions of the most common problem snakes. Shows how to sensibly deal with problem snakes and other reptiles. Removes fear and provides a better understanding of snakes in general. Gives details on how and when to get help.